Since 1946, the American Federation of Labor and the Congress of Industrial Organizations (AFL-CIO) and United Way Worldwide have enjoyed a collaborative relationship through which they and state and local United Ways have provided services to members of organized labor, their families and their communities. United Way of Southeastern Connecticut’s strong partnership between management and labor has a positive and powerful impact on the community. Labor representatives serve in many key leadership roles within United Way including the Board of Directors, Campaign Cabinet, and Allocations. Of the funds raised during the annual United Way Campaign, 55% of the dollars come from local businesses and organizations that have members of organized labor. 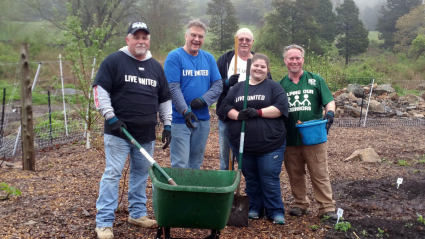 Members are also actively engaged as volunteers, running food drives, school supply drives, and participating in community service projects all across New London County with United Way and at other nonprofit organizations. But the relationship between United Way of Southeastern Connecticut and organized labor extends far beyond giving and volunteering to a true, year-round, collaborative partnership. And in the end, the beneficiary is the community-at-large. One of the most enduring partnerships is the Gemma E. Moran United Way/Labor Food Center. Established in 1988 by United Way and with the strong involvement and support of organized labor, the Food Center now provides more than 2.1 million meals and snacks at no cost to those in need through 84 local distributions sites including food pantries, community meals sites, and United Way’s Mobile Pantry. To this day, local unions ensure this program remains strong and viable, and is helping to fight hunger and food insecurity in southeastern Connecticut. UCAN Union Counseling where labor volunteers are trained on the information and skills needed to refer co-workers, family members and neighbors in need to existing social services. United Way’s Project Warm-up emergency winter heating assistance program to ensure no one falls through the cracks and freezes in their home. The annual Workers’ Memorial, held each year on April 28, to honor those whose lives have been lost on the job. Free information and referral for households in need of help and guidance during a difficult period. Volunteering to pick-up remaining product, including food and household items, after vendor shows at the local casinos. Labor volunteers and their families work late into the night gathering and packaging the items, then delivering everything to the Food Center. Assistance during lay-offs at local companies where United Way and the Department of Labor provide vital information to assist laid-off individuals. This information can be found online at United Way’s website, Where to Turn for Help, at uwsect.org/where-turn-help. Other activities of United Way and local unions include an annual AFL-CIO Golf Tournament to benefit Project Warm-up, the Stamp Out Hunger food drive held every May with the help of local letter carriers, and a New Hires program during which information is provided at new employee orientation about the services and programs available in the community and how United Way helps. United Way of Southeastern Connecticut’s long-standing partnership with the generous members of organized labor translates into a better, brighter community for us all. Their unwavering dedication to United Way’s work and the entire community exemplifies what it means to Live United. To learn more, visit uwsect.org/labor.